This is a six ink printer that also has a display and accepts inputs from various card types and USB sticks. However it is not only USB and Ethernet but it can also print via Bluetooth. This is quite a low slung unit at 45x41x16cm, only the final measurement could be greater if you have the TFT raised vertically it would add 7cm to the height. As paper is stored flat in the base and delivered on top of this store no further space is required. The depth includes the 3cm that the power lead sticks out the back of the unit. The weight of it is around 8kilos so it could go in a cupboard on a strong shelf if you can run an Ethernet cable to it or print via Bluetooth. While it is no beauty - what printer is - why hide it when you insert a range of printer cards and can print directly from them. Getting the screen angle right should not be a problem as it goes up in 22.5 degrees increments to 90 degrees. This unit has four print modes, fast draft, fast normal, normal and best. As fast draft is the fastest a lot of my test pages are printed in this mode. For the ubiquitous 200 word document - the nearest one can get to those secret test pages - I managed 20PPM and as always I get this speed by ignoring the first and last page, so the timing starts as the second page starts to print and finishes as the penultimate page prints. For the more normal 1500 word document (spread over four pages) this printed just on 16PPM. The print quality was black and quite crisp so perfectly acceptable as memos etc, a lot better than the draft mode for some manufacturers that is no more than a mushy grey. As the specifications give a time for printing 15x10cm images I have also timed this as well as my normal A4 single images and A4 with four images if possible I print both of these borderless. Firstly a 15x10cm image printed direct from a card onto the photo paper loaded in it's dedicated tray above the main A4 tray, this took 25seconds from printing stated but there was close to 15seconds thinking time by the unit so I make that 40seconds. As I accepted the defaults this was not best quality ok but it lacked sharpness and sparkle. Next I printed the same image from inside Windows using the standard Windows Print and Fax viewer, accepted the default for 15x10cm photo paper. There was close to 15seconds before printing but then the page printed a lot slower at 85seconds but the images was excellent. Next printing A4 borderless this timing is always from within Windows as not all printers are capable of printing A4 direct from the unit. The time for four 9x13cm stretched images so only a white '+' was visible on the page and no edge borders was 130seconds from the start of printing (again around 15 seconds dead time for processing before printing started). To print a single A4 borderless print was 132seconds with the same dead time. Images were quite acceptable without being outstanding. This is a six cartridge printer - two shades or red and blue one yellow and a slightly larger black - and just maybe the image printing could have been slightly better. I found no problems with paper jams using plain paper even when different types and weights were used in the same batch. However printing photo paper sometimes needed a nudge through the main paper tray and certainly only a single sheet at a time to avoid getting the out of paper message. Both the unit and Windows are loaded with HP Photosmart Essential 2.0 software, I would have expected the full software on the PC. 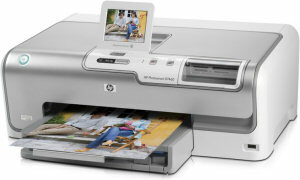 Doing my Internet searches found the HP Photosmart D7460 at a best price of £139.35 including free delivery from the first link below.